George Clooney is an American actor, screenwriter and movie producer. He came to public attention as Dr in the TVshow ER, and has since appeared in many films, including Batman & Robin, Ocean’s Eleven, The Decendants, and Gravity. He has received three Golden Globe awards and two Oscars. He is also known for his humanitarian work, especially highlighting the conflict in Darfur. Clooney and Prendergast launche The Sentry, an initiative to find and bring justice to those that profit from conflicts in Africa by exposing how conflict is financed and profits laundered, with a website encouraging people to anonymously submit leaks and tips. Downtown Abbey debuts their short film benefiting the ITV Text Santa Campaign starring Clooney as the honorable George Oceans Gravity, marquis of Hollywood. The campaign is an annual drive that raises awareness for a variety of charities, including Marie Curie Cancer Care and Alzheimer’s Society. Clooney claims that he and his agent Bryan Lourd presented a petition to the powerful people in Hollywood to sign in support of Sony not submitting to the Sony hacker’s demands, but no one would sign it. It was a large number of people. It was sent to basically the heads of every place. They told Bryan Lourd, “I can’t sign this.” What? How can you not sign this? I’m not going to name anyone, that’s not what I’m here to do, but nobody signed the letter, which I’ll read to you right now. The couple marry at the Aman Canal Grande Hotel in Venice, Italy, surrounded by their families and many A-list guests, including Matt Damon, Bono and Cindy Crawford. The ceremony is conducted by Walter Veltroni, the former mayor of Rome and Clooney’s close friend. Press and paparazzi followed the wedding party and guests, as they sailed around the canals on boats. Today’s ceremony is symbolic, with a civil ceremony is expected to take place on Monday (spet 29). A 50-foot stretch of the Grand Canal waterway in front of the 16th-century Cavalli Palace will be closed for two hours that day. Olha mais do casamento do Bofe #clooney! We have to work very hard to keep our pictures OUR pictures. If you see someone taking a photo with a phone … you can help by notifying security. A representative for the show’s UK network, ITV, says the actor will appear in a Downton Abbey-related film made for ITV’s charity program, Text Santa. The annual fundraiser raises money to support six UK charities, including Alzheimer’s Society and Teenage Cancer Trust. Clooney will not appear in any Downton Abbey episodes. What separates this from all of the ridiculous things the Mail makes up is that now, by their own admission, it can be proved to be a lie. In fact, a premeditated lie. So I thank the Mail for its apology. Not that I would ever accept it, but because in doing so they’ve exposed themselves as the worst kind of tabloid. First of all, factually none of the story is true. Amal’s mother is not Druze. She has not been to Beirut since Amal and I have been dating, and she is in no way against the marriage, but none of that is the issue…The irresponsibility, in this day and age, to exploit religious differences where none exist, is at the very least negligent and more appropriately dangerous. The MailOnline story was not a fabrication but supplied in good faith by a reputable and trusted freelance journalist. She based her story on conversations with a long standing contact who has strong connections with senior members of the Lebanese community in the UK and the Druze in Beirut. We only became aware of Mr. Clooney’s concerns this morning and have launched a full investigation. However, we accept Mr. Clooney’s assurance that the story is inaccurate and we apologize to him, Miss Amal Alamuddin and her mother, Baria, for any distress caused. Clooney appears on the cover of People to discuss how he discovered his fiance, Alamuddin, was the one. They want the people they love to know that this is real and that they plan on being together forever. They’re money coddled, they’re highly privileged, We are talking about successful artists like George, Barbra Streisand … they live in a relatively small world, the people around them are very solicitous and caring of them. They have a worldview that is therefore ‘Everything should be given to everybody’ because everything has been given to them. 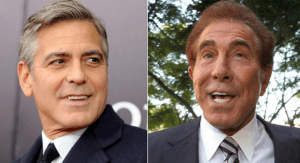 Wynn also said that as a billionaire businessman, he has a broader perspective than Clooney. You have to protect the enterprise in order to take care of the employees. So therefore, you can’t be wasteful, you can’t squander things or you jeopardize people. Running a business gives you a sense of compassion that is defined in different terms than someone who just thinks of themselves as generous. 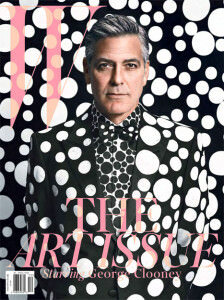 Clooney appears on the cover of the annual art issue of W magazine. Inside the magazine he shares who his ideal woman is. When I was a kid, I was in love with Audrey Hepburn. I watched Roman Holiday when I was 11, and I thought she was as elegant as anything I’d ever seen. And I fell madly in love with her. I also always loved Grace Kelly. I mean, when she comes out of the water in To Catch a Thief, I thought, That’s the most beautiful woman I’ve ever seen. Clooney plays astronaut Lieutenant Matt Kowalski in this science fiction thriller written and directed by Alfonso Cuaron. Kowalski is on a mission with medical engineer Dr. Ryan Stone, played by Sandra Bullock, when their shuttle is destroyed by high speed debris from a damaged Russian satellite. Kowalski saves Stone from drifting off into space and then together they must find a way to get back to Earth. The great thing about this film is it’s an argument for coming to a theater and seeing it on a big screen. To find films that make sense and make it an event to come here and do that, I think that’s extraordinary. Stacy called it quits. She wants to have children and a family someday. She knows where George stands on that. They talked and they quietly stopped being a couple several weeks ago. They talk every day. They were friends before they started dating and they’ll be friends after. It was a friendly breakup. You can’t hold grudges. It’s hard but you can’t hold grudges. And it doesn’t matter how you get knocked down in life, because that’s gonna happen. All that matters is that you gotta get up. Violet, Sam and Sera, I love you; this is for you. 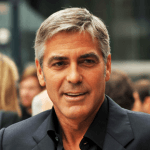 Clooney talks about his childhood, how he got into acting, and various roles he has played. Seacrest interviews Clooney during On Air With Ryan Seacrest about the difficulty of acting. Acting is not hard work. I find it challenging and sometimes I’m very bad at it, but I don’t find it hard. Clooney are Keibler start dating after meeting at an Oscars Party. Clooney is nominated for Best Actor at the 82nd Academy Awards for portraying Ryan Bingham in Up in the Air. Clooney is nominated for Best Actor at the 80th Academy Awards for portraying Michael Clayton in Michael Clayton. I probably-definitely-wasn’t someone who should have been married at that point. I just don’t feel like I gave Talia a fair shot. I was responsible for the failure of that marriage. The couple divorce after nearly three years of marriage. Clooney claims the reason for this divorce was his youth. I probably, definitely, wasn’t someone who should have been married at that point, I just don’t feel like I gave Talia a fair shot. Talia is a lovely girl. But they probably shouldn’t have got married while George’s career was on the verge of such a white-hot period. In truth, neither of them is to blame. There was just too much going on in their lives to give marriage the effort it needs. They both wound up getting hurt, which is really too bad. The couple marry in Vegas. 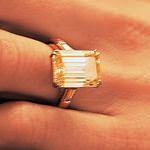 The couple have only been dating for a few months and the wedding is a small affair, with only close family present. An Elvis impersonator officiates at their wedding. 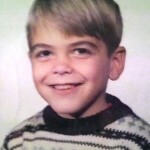 George Clooney is born in Lexington, Kentucky, United States of America to beauty queen/councilwoman Nina Bruce and newsman Nick Clooney. Clooney has an older sister, Adelia. Clooney is raised a strict roman catholic. In middle school he suffers from Bell’s Palsy. He plays baseball and basketball throughout his schooling at Augusta High School where he reportedly receives all A and B grades. My dad taught me the value of listening and learning [but] the most important lesson [is] never to put people down…[Bell’s Palsy is a] tricky thing. So, you develop a better personality and learn how to make jokes about it.